Receiving on-course instruction from McLean Golf School Instructor Pomp Braswell, at the SunRidge Canyon Golf Club. With apologies to the Mamas and the Papas, Monday morning gave us no warning of what was to be. 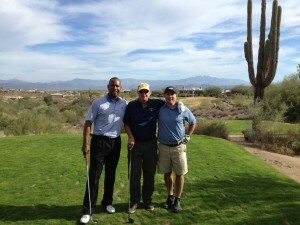 And yet, on a workday that so many salary-men have come to dread, the Golf Road Warriors kicked off our best day of the week in Scottsdale, starting with a visit to the SunRidge Canyon Golf Club and a clinic at its relatively new Jim McLean Golf School. We received a quick lesson from two of the most personable teaching pros I’ve ever encountered, and played 18 holes on a course that is both scenic, challenging and wicked, the latter adjective being a point of SunRidge Canyon pride. Located between Scottsdale and Fountain Hills in a breathtaking Sonoran Desert canyon, this Keith Foster design opened in 1995. Beyond the rough flanking the tight fairways is trouble, a desert full of cacti, brush, boulders and wildflowers. Still more danger awaits in unseen washes, several lakes grass bunkers and deep sand traps. 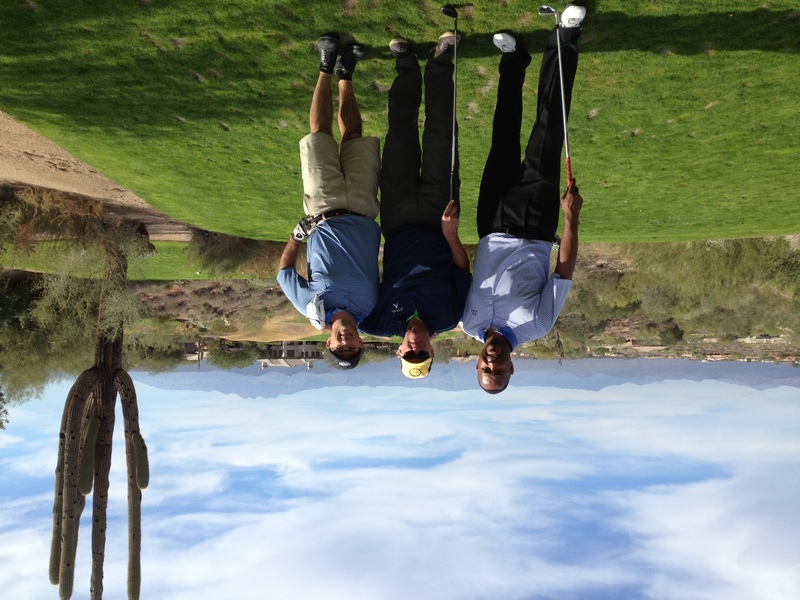 Although there are sublime views of the Red, McDowell, Superstition and Four Peaks mountains that surround the golf course, one is well advised to pay attention to the course. This par 71 plays at more than 6800 yards from the back tees, with a 72.6 course rating and a nasty slope of 142, which makes it feel considerably longer. The seemingly benign gold tees, at 6400 yards, carry a painfully sharp 135 slope rating. Although SunRidge doesn’t get as much attention as many other name resort courses in Scottsdale, it draws more than its share of PGA Tour pros, as well other professionals out to refine their games on a difficult track. Sometimes ranked as the number one golf school in America, Jim McLean Schools operate in Florida, Texas, California, Utah and Spain. His staff does not teach a strict method of golf – – since body types and swings differ from person-to-person – – but work on several fundamentals of swing parameters called “the corridors of success,” to get the body in position for an on-plane downswing. Proper posture, set-up and grip can eliminate what McLean calls “death moves” that will cause a golfer to forever hit poor shots. 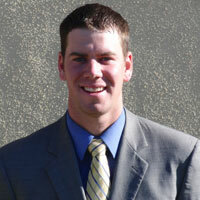 McLean Master Instructor and Director of Operations Justin Kemballa. The McLean approach and SunRidge ambition are evidently met by Braswell and Master Instructor and Director of Operations Justin Klemballa. A native of upstate New York, Klemballa has spent nearly a decade working as an instructor, including training at McLean’s flagship score in Doral, Florida, and time at its La Quinta School in California. With high energy and a playful sense of humor, the lanky Klemballa adjusts his teaching approach to meet a player’s needs and the time involved. For example, as I was hitting drives on the range, which launched with a good 45 degree trajectory, he asked if I was happy with the ball flight, a gentle fade. No, I said, because the fade cost distance. Klemballa could have given me a strong grip or a very different stance, but simply suggested that with my left hand, I grip the club with a three, on a scale of pressure from one to ten. “With your right hand give it a five,and see what happens.” The drives started going straight, the easiest and quickest tip imaginable. Each of us took turns being filmed in the hitting bay, with Pomp Braswell filming and analyzing 50-yard pitch shots. Born in Harlem and raised in South Central Los Angeles, Braswell learned to play golf while serving in the military, in a Black Operations program. A self-admitted beginning hack, the discipline clearly served him well as he improved enough to play for San Jose State University, and to compete on the Nationwide, Canadian, Hooters and other tours. Before joining McLean, he worked at the John Jacobs Golf School and with the Dave Pelz short game operation. After the clinic we headed out in two groups, with Pomp accompanying us on SunRidge Canyon’s front nine. On the first hole, circumstances put me out 50 yards from the pin. Applying what I’d learned in the hitting bay, the pitch landed and stopped four feet from the cup. And yeah, the putt dropped. Braswell, Stuller and Wallach on the SunRidge Canyon front nine. What’s more, during the round I put five or six other pitch shots to near kick-in range, which I think endeared me to my instructor. Clearly, Braswell can play and teach. Unfortunately, he left my group for another as we headed into the back nine, which concludes with “The Wicked Six,” several of which are long, uphill and into the wind. I was on my own and it showed. Nevertheless, following golf we spent an hour in rocking chairs around SunRidge Canyon’s circular fire pit, nursing a couple of beers and snacking on several plates of beef and chicken nachos. Soon, Braswell had to leave for another lesson. We didn’t have much time for getting back to our resort, to clean up and get ready for dinner. 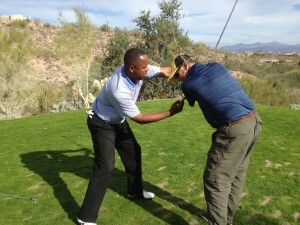 Check off another day with the Golf Road Warriors, Scottsdale 2012, but one where we all learned a new thing or two from a pair of excellent instructors.